Home » For schools » Week 26: Whose story? We catch up with Stevenson on the Buffalo this week who is worried about the 50 children who seem to be allowed to ‘run wild’ onboard. 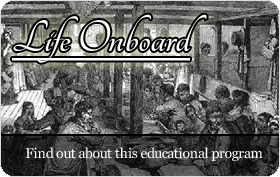 Stevenson thinks that the children should be provided with some form of education during the voyage. Not everyone onboard agrees with Stevenson’s view but it is his perspective that we are able to read about this week. How would other passengers write about the children? Were they really ‘running wild’ and what does Stevenson mean by this? This week we will look at how primary sources such as diaries help us to find out what happened in the past through one person’s eyes. If other people have another side of the story to tell, how can we find out about it? How do people remember and pass on their experiences from the past and what happens when people have conflicting stories and memories of the same event? Whose point of view is represented in this week's posts? Which information in this week's posts can be considered fact and which information is somebody's opinion? For what purpose did this week's authors record their thoughts and experiences? Who was their audience? What are the differences between primary and secondary sources? Where can we find primary sources and what do they look like? What are the main questions we need to ask when using primary sources? Consider the terms primary and secondary sources. Compile a class list of documents, objects and other items that can be used as historical primary and secondary sources. How can we use these sources to find out when events occured and to place events in chronological order? If you were able to interview Stevenson about the children onboard what questions would you ask him? How do you think he would answer your questions? As you can't actually speak to Stevenson, what other research can you do to find out more information about the children onboard? Analysing and using sources Read through some of the journals in this week's posts. Make a list of things that could be facts and those that are opinions. Select two different journal entries from this week's post. Copy the text and paste it into a Wordle to make two separate word clouds. What are the key words that stand out in the Wordles? What can you tell about the point of view of each author by comparing these word clouds? Design a FaceBook page for one of the children onboard. Who would their friends be and what would they say to each other. What groups would they belong to and what events woudl they like? Include some status updates for different parts of their day onboard the ship. 2. Select a television program and ask all students to watch it at home. After everyone has watched the program, provide students with a list of 5 scenes from it and ask them to place the scenes in order. Did all students place the events in the same sequence? Discuss why students may have recalled the details of the program differently. Explore this idea with similar activities, for example: make a list of phrases and quotes and ask students to sort the list into those that were featured in the program and those that were not. Discuss the range of opinions and feelings about the program in the class. How were opinions and feelings influenced by who it was watched with, where it was watched and what else was happening around them. 3. Collect a range of news reports about the same current event. Include newspaper articles, television news segments, radio podcasts and online news reports. Ask students to compare and contrast the reports. In what ways are facts and opinions expressed in the reports? Which features of the news items show the author's point of view? Is one perspective represented more strongly than others? Are there any examples of conflicting information or facts in the reports? How can this happen when people are talking about the same event? 4. Choose an event such as Sports Day that most students in the school particpated in earlier in the year. Interview students from other classes about the event. Construct survey questions that enable the students to give facts and opinions about the day. e.g. What was the first event on Sports Day? What time did Sports Day finish? What was your favourite event? Which team tried the hardest on the day? 5. Brainstorm all the ways that classroom life is recorded, roll call, work books, photos, journals, newsletters, diaries etc. Work in a small group to present a role play showing how some of these records might not show correct information. Did someone come to school after the roll call and the teacher forgot to update the roll? Were names on a class photo printed in the wrong order so it looks like people have different names? 6. Play Chinese Whispers and discuss why the messages get changed along the way. Which messages are most likely to get mixed up? Suggest and trial strategies for improving the accuracy of messages when they reach the last person. What if this week's diary entry had been written by one of the children onboard? How do you think the behaviour of the children would now be described? Consider the following statement and form your own opinion. If the information we read about an event was written by someone who was there at the time it must be entirely true. Next week we catch up with the Africaine as it crosses the equator. Our journal authors make reference to longitude and latitude points. 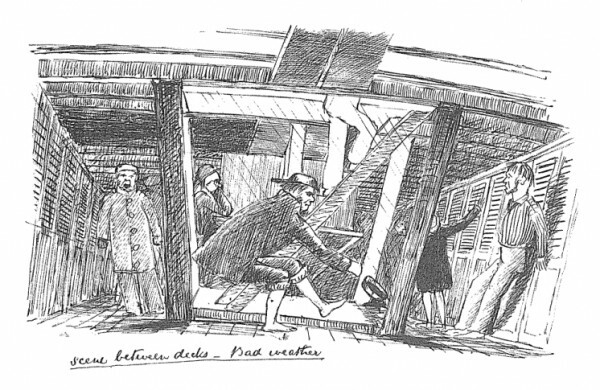 We'll take a look at how the captains of our ships were able to navigate their vessels safely to South Australia. What types of equipment did they use? How did they use maps and what are the necessary skills in navigating a ship across seemingly never ending seas. Join us next week to find out more.